The West Chester University football team (4-3, 3-1 PSAC) took down Shippensburg University (5-2, 3-1 PSAC) 31-15 on Saturday, Oct. 8, which happened to be the day of WCU’s Community Day. The victory came while the students were on a brief hiatus for fall break, but the Golden Rams’ minds were parked into “game mode” as they were focused on prying away a win to help improve their standing in the PSAC in hopes of clinching a postseason berth. WCU was led by their defense, which held the Red Raiders to zero points and 78 yards of offense in the first half. Sophomore linebacker Steven Denby had himself a field day filling in for injured middle linebacker and senior co- captain Ralph Reeves, finishing with 11 tackles (seven solo) in what marked his first career start. Kevin Malone picked off Red Raiders quarterback Chase Yocum and returned it for 10 yards, adding to Denby and WCU’s monstrous defensive effort. WCU also sacked Yocum three times for 25 yards. Coaches were elated to see that the productivity Reeves usually brings did not taper off, and Denby may have earned himself more playing time in the very near future with this performance. The Pennsylvania State Athletic Conference named Denby their Defensive Athlete of the Week for his dominant showing, making it the first defensive honor that has been bestowed upon the Golden Rams in the 2016 season. Pat Moriarty re-assumed his starting position at quarterback due to the fact that Andrew Derr has been shelved the last two games thanks to the nursing of an achy foot, and he put on a masterful performance to the tune of 338 yards and two touchdowns on 20-29. Moriarty lofted two passes into the end zone in the first half and both were to Tyler Karpinski, who finished the win with a team-high seven re- ceptions and 103 yards. The first score was a five-yard heave towards the end of the first frame, and the second touchdown snag came a mere three seconds before halftime right at the goal line. Jarel Elder was also an active scoring participant at the party, scoring two rushing touchdowns in the 2nd quarter within the span of five minutes of game time. Elder finished the contest with 173 total net yards, amassing 77 via rushes, 74 receiving and 22 on kickoff returns. The Red Raiders didn’t get on the board until the 6:02 mark of the third quarter, and by then the Golden Rams possessed a comfortable 24-point lead, a number that proved to be insurmountable for Shippensburg. Ship managed to post one more touchdown, which came at the end of the final period, which only made the score look more respectable than what actually unfurled on the field. West Chester followed up their pounding of Shippensburg with 27-7 road rout of Bloomsburg University (4-3, 2-2 PSAC), spoiling the Huskies’ homecoming. 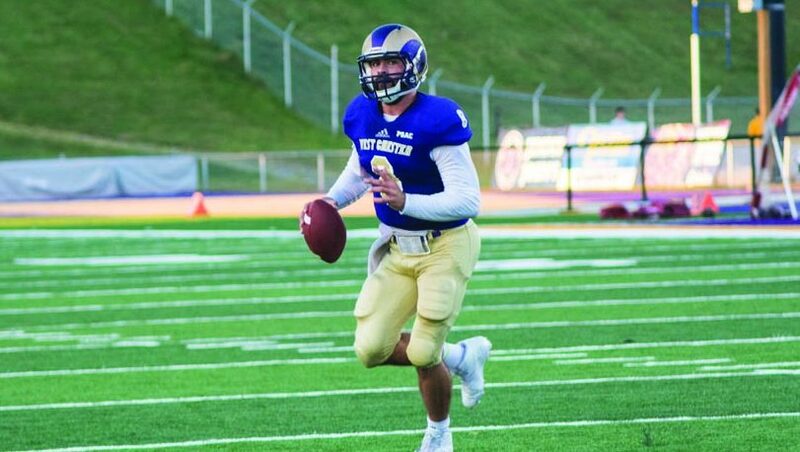 WCU’s offense didn’t hum at the boisterous level that the team has been accustomed to hearing this season, but again the Golden Rams’ defensive approach mirrored that of a clinic, falling 16 seconds left of a shutout of the Huskies. Moriarty played an efficient and meticulous game at the offensive helm, finishing with 197 yards and one touchdown on 11-18, but it was Eerin Young and Elder that engineered offensively this time around, as the duo finished with 183 yards on the ground. Elder recorded two touchdowns and racked up 44 additional yards between receiving (16) and a 28-yard kickoff return. Paul Dooley also chipped in with his first career rushing TD with a little under three minutes remaining in the contest, and WCU was eyeing their first shutout of the Huskies since 1982, but a touchdown pass from Duffy Gilhool to Chad Hoffman with 16 seconds remaining threw a wrench in their plans. Karpinski had his second consecutive game of more than 100 receiving yards, as he finished with 105 on four receptions. Bloomsburg’s offense only spawned 54 yards of total offense in the game’s first 30 minutes and registered zero yards via aerial attacks in that same timeframe. West Chester held Bloomsburg’s dynamic running back Lawrence Elliot Jr. to a meager 55 yards on 14 attempts, which caused the Huskies’ offensive train to veer completely off track, which assisted WCU in claiming the victory. The Golden Rams also recorded three sacks, with Kevin Duggan, Ch’aim Smith and John Dubyk terrorizing Bloomsburg quarterback Gilhool with their defensive prowess. WCU now sits in a second-place PSAC tie with Shippensburg University and looks to gain the upper hand in the standings with a victory of Cheyney University next week, which will be West Chester’s homecoming game. The Golden Rams will kick off the Hoco contest at 2 p.m. on Saturday, Oct. 22, so be sure to trek down to Farrell Stadium to cheer on West Chester and enjoy some homecoming festivities.